Join Craig Torres, a Tongva descendant, to learn more about using native plants in everyday life and get ready to refocus your cultural lens and renegotiate your relationship with NATURE. Join us for a timely workshop focusing on our favorite plants to use to save the maximum amount of water while providing the maximum amount of habitat for birds and butterflies, and a beautiful, low maintenance landscape. Reginald designed and installed the landscape design for the first Platinum LEED home in Orange County, as well as for the first home in OC to earn the Build It Green, GreenPoint Rated designation, and many other beautiful, locally native gardens since. 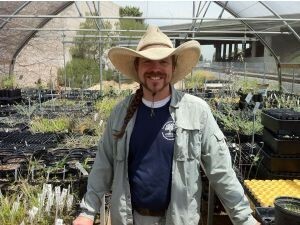 Working with Lori Whalen, our volunteer Designer, Reginald has installed numerous landscapes featured in several local native plant tours and home and garden tours in select areas of Southern California. Going Native: Irrigation Modification for Native Butterfly Plants..